German manufacturer HK Audio will begin offering its Elements modular sound reinforcement systems for the first time in the US. Elements merges the benefits of modern line array technology with the portability and easy handling of ultra-compact P.A. systems. The concept enables users to easily put together a system suitable for every situation using just six easy-to-combine components. The system can be configured to support anything from an intimate speaking engagement to a multi-instrumental concert with a full 3600 Watts of Front of House power. 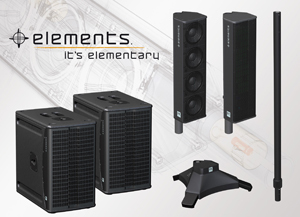 Elements is based on line array technology for superb sonic performance, consistent with other product offerings from HK Audio. Setting up the Elements system and tearing it down again is quick and easy. With E-Connect, HK’s proprietary integrated signal routing system, even the largest Elements setup is performance-ready in just a few minutes with a minimum of cabling. Due to the extremely compact and rugged design, every configuration fits into a compact car, for ease of transportation. E435: The elegant mid/high unit is made from extruded aluminum, is strictly based on line array technology, and provides a rich, even sound field. It houses four 3.5” broadband speakers, and with its mere 5.2 lbs., it’s a true lightweight. Thanks to E-Connect, the E435 quickly and easily connects with other modules. EA600: Aesthetically and performance-wise, this amp module blends in well with the E435. The Class D power amp puts out 600 Watts, enough for four mid/high units or one passive sub and two additional mid/high units. Weighing only 6.1 lbs., the EA600 is a breeze to tote. E45: This stand is equipped with extendable feet, serving as a solid base for mid/high units, amp modules or the mounting pole. E110 SubA: This portable 10" subwoofer weighs only 41.9 lbs. and delivers a precise low end. The digital Class D power amp provides 600 watts, enough to feed another passive subwoofer or two more mid/high units. Equipped with two E-Connect sockets, the E110 SubA also serves as a base for additional elements. The integral handle makes it comfortable to carry. E110 Sub: For applications requiring more low-end, this passive sub is the ideal add-on. It is powered by an active E110 or an amp module. To accommodate auxiliary elements, this sub is also equipped with an E-Connect socket.